Our erstwhile arcade sleuths, CHRIS PASSEY & MATTHEW UFFINDELL dust off their track balls and compare some Spectrum ‘Missile Command’ type games. 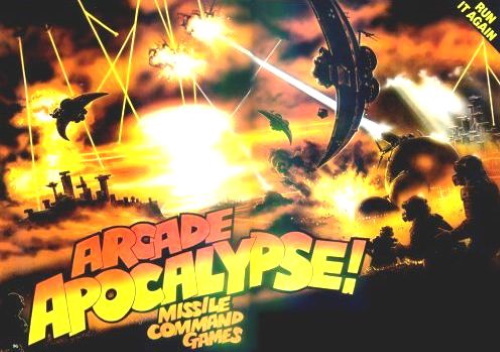 ‘Missile Command’ is the arcade classic in which the player defends six cities from enemy missiles. These missiles leave traces on the screen, splitting up at lower levels to make life more difficult. In addition planes and killer satellites move across the screen dropping more missiles. Heat sensitive missiles (or smart bombs) are able to avoid your defensive explosions and have to be hit accurately (direct hit) or deluged with explosions. Defence is by means of three missile bases, each having ten missiles. Any missile you launch will head for, and detonate at the point where your cross wire sight is set. The game continues until all your cities have been destroyed. The control of the sight is achieved by means of a track ball, which gives a very positive, accurate movement (analogue) and is very necessary for this type of game. The Spectrum games, of course, do not have a track ball provision. This is quite an accurate copy of the original in layout, and has the six cities and three laser bases. Each base has its own fire button. Although the keys are fairly well laid out, individual base firing is rather difficult with a total of 7 keys. Because of this, I welcomed the computer-aided firing option which allows you to fire from the nearest base with one key press. This has a slight bias to the outer bases to avoid draining the centre one. The Kempston option greatly improves playability. Graphics are quite good and colourful but not very smooth. The explosions are quite different from the original, being clouds of smoke. Good sound with a nice frying noise adding to the feel. There are planes and satellites, also smart weapons (move straight down). These latter are a little jerky due to character position movement. Overall, a reasonable game. This has a two-part load — you input whether you want to use a Kempston joystick. The first thing you notice about this version is its sound, very good effects. The cross hair movement is block and not smooth — not actually a disadvantage as the explosions are realistically long lasting. This version has several features which the Softek one doesn’t like alien craft and satellites and intelligent missiles which hover over your explosions until it’s safe. Also three missile silos and a useful auto-fire select. A game that is a good copy of the arcade original and I think is the second best version for keyboard use. This is a variation on the theme, basically the same in essence but a few points have changed. There are still six cities but no missile or laser bases. Your defence missiles ‘appear’ from the centre of the screen, leaving no trace behind them. They take off at angles, altering their flight path to reach their destination (detonation!) point. They appear to be fired in groups of two with a slight pause between groups. Explosions caused by the missiles are nice, big, smooth balloon types, very similar to the original. Incoming missiles, which split at lower levels, do leave a trace. Due to the wrap around screen, any going off one side will reappear from the other. I liked this added touch. The graphics are smooth (pixel movement). There is also a spy satellite, but no aircraft or smart bombs. The colour at one point spoils the game by altering whole character squares when explosions occur (only on the light blue screen). Generally control is quite easy but the Kempston option is obviously far better. Although 5 skill levels are provided the game is not really challenging enough (perhaps because it is easier to control than most of the others). This is the best of the two Armageddons, and fairly good overall. Armageddon by Ocean is Kempston compatible although you don’t really need a joystick because of the good keyboard layout and fairly easy game. The cross wire sight is moved in a very controllable manner. You are allowed 32 plasma bolts to defend yourself, which produce a fairly rounded explosion, not too bad at all. Every so often an odd looking space ship passes overhead and fires bombs at you. The sound is good but the colour is only average used. Not such a demanding game, so it’s value is lessened. This had by far the best explosions, they are extremely similar to the original — perhaps even better! The firing is rapid, so you can put up an excellent barrage to deal with the attacks. Planes drop bombs and there are smart weapons to contend with as well. The colours are generally good but on one level things are a little difficult to see due to the colour choice (also happens on the the arcade original)! Another small point is that the sight can sometimes disappear when moved quickly. This version is really fast and will be enjoyed by players of the arcade version. But the game has one major fault — key layout. The control keys are the cursors, which are bad at the best of times. Fortunately Kempston owners are catered for. Ironically, under keyboard play it is probably the worst of the bunch, whereas with a joystick it is the best. I noted that after about 6 levels a garbled mess of large print appeared at the top of the screen but it didn’t affect the game. Anirog have produced an excellent reproduction of the original in every way. There are 7 keys to control, four for direction and three for movement, which means you must possess a weird type of hand — or better still, a Kempston joystick. All the keys act instantly though. This is the only version which has sound effects when your missile takes off, ending up with a really impressive explosion (sound too). Detailed fighter craft fly overhead releasing even more missiles. Good colours and graphics, I would pay 10p a game to play this one in the arcades. The best of the Bunch. This another game which falls down on the keyboard layout — all along the top row. The game itself has fairly simple graphics, the explosions being reasonable, but inferior to those of Anirog or Ocean. It is reasonable as a game, but due to keys, only a joystick game really (Kempston and Sinclair). Three skill levels and a 2 player option are also provided. With this version one or two players can play with a choice of 3 skill levels. There are 36 missiles for your defence in this comparatively tame version. Every 1,000 points scored awards you an extra city. The cross hair moves quickly and smoothly, and firing a missile results in a realistic explosion with good sound too. I like the colour, and it is a good noisy version, but its addictive qualities are slight, and its appeal wears off after a couple of hours. Here we have a game with quite a good key layout. The game is a little different to the original, having only two outer bases each with individual firing. Graphically, things are average and the defending explosions are rather short in duration. A barrage of fire is impossible. Enemy missiles hitting your cities cause nice little atomic clouds. Only smart bombs have been included from the original. The game is ‘alright’ but not particularly exciting. There are no joystick options — the keys are okay (they’re supposed to be user definable, but they’re not). Although Mikrogen say this is a version of ‘Missile Command’ it isn’t a close copy at all, with only two independently firing bases. There are the six cities, but no alien craft. The colour and graphics are above average and the sight movement keys are well placed, not quite so good for the firing keys though. The explosions look good and realistic but the cross hair moves quite slowly which makes it difficult to defend properly. Although essentially a ‘Missile Command’ game, this one is rather altered. You defend six cities with a central laser tower, armed with 30 laser bolts. The attacking missiles are stopped, not destroyed, by hitting them on the tip. This is no easy task, considering that the explosions are instantaneous flashes. Pin point accuracy is required when compared to other versions. The key layout is probably as good as possible, but it still does not give enough control to achieve such accuracy. The graphics are fairly simple but reasonably smooth (not the explosions though). The sound is one of the game’s better points. Being a bit different, it makes a change, but keyboard is out here too. Kempston option. This is the only version to have several keys doing the same function, eg. Q to T is ‘up’. Even so, I found the key positions to be badly laid out. Sound plays an important role in this game. Alien missiles tend to change direction quite often, making life even more difficult and the explosions are ultra-short. For some reason the screen area for play seems to be very limited, I don’t know why — perhaps it is just crowded. Keyboard response is good as is the cross wire movement. Once all the cities have been destroyed, a great flashing explosion takes place. A fair to poor copy of the arcade version, and I thought, the worst of the bunch. This game is very similar to Electro Storm in several ways. It has the central firing base armed with 30 missiles; also the explosions are very short, almost flashes. The graphics are generally okay but colour is poor and stays the same throughout the game (in the original each sheet has a different colour). The missile traces don’t split up and they all tend to descend vertically. The game does contain missile-dropping planes and satellites, which move about very rapidly. The cross wire movement is jerky, especially under Kempston control. Control key play is poor, especially with the accuracy required, so the joystick version is better. This version is unexciting. This is one of the older Spectrum versions. The inlay states all the control keys with the exception of ‘fire’, which is nowhere to be found. The cross hairs can be easily positioned with the responsive, well laid out keys. The game itself doesn’t really speed up as it progresses — just more and more missiles fired at you. Every now and then an alien flies over dropping more bombs on you. Explosions are short-lived — just a flash of white and it’s gone! A fair copy with sound and colour quite well used, but nothing to write home about. To be enjoyed to the full, ‘Missile Command’ games should be played with a joystick (shame there is not a track ball) because keyboard play, in general, cannot give the same degree of accuracy and control. Although the same may be said for many other types of game, we are sure ‘Missile Command’ fans will agree that this is the game which needs it the most badly. Therefore the ratings given below have been split in two, one for keyboard only play, and one for joystick play. The two reviewers figures have been averaged as, in general, they turned out to be in agreement. Ratings are given on a scale between zero and 100 points, and do not reflect what a game may receive in an actual review.